First published in The Real Review 1, Spring 2016. Notes on Ann C. Huppert, Becoming an Architect in Renaissance Italy: Art, Science, and the Career of Baldassarre Peruzzi. Between the 14th and 16th century the European city developed from being civitas to what the architectural historian Manfredo Tafuri defined as machine for the extraction of surplus value. See: Manfredo Tafuri, Architecture and Utopia: Design and Capitalist Development, Barbara La Penta ed. (Cambridge, Ma. : MIT Press, 1976), p. 16.Politics and ideology did not disappear but they became increasingly tight and subservient to the re-organization of urban space for the sake its economic exploitation. The birth of the architect as distinct professional in the 15th century parallels the advent of capital as leading force behind the rise of cities as centers of political and economic accumulation of power. It is not by chance that cities like Florence whose banking economy was one of the most powerful in Europe became the place where the ‘professional’ architect as we know it today came into being. Filippo Brunelleschi’s authorial achievements such as the Dome of Santa Maria del Fiore in Florence were possible because there was an elite who empowered him to take away the leadership over the building of major public works from stone-masons and wood-cutters. See: Pier Vittorio Aureli, ‘Do You Remember Counterrevolution? 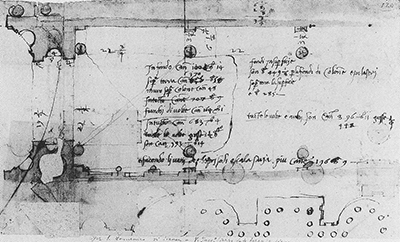 The Politics of Filippo Brunelleschi’s Syntactic Architecture’ in “AA Files” n. 71, pp. 147-165 These circumstances inspired Leon Battista Alberti to theorize architecture as a design project whose disciplinary goal was to single out the architect as a professional figure clearly distinct from builders whose craftsmanship was increasingly downgraded and subordinated to the architect’s design and thus to the patron’s brief. The passage from architect-as-masterbuilder as architect-as-author has been discussed by many architectural historians, yet the two standout text on this topic are: Marvin Trachtemberg, Building-in-Time, (New York: Yale University Press, 2010). Mario Carpo, The Alphabet and the Algorithm (Cambridge, Ma. : MIT Press, 2011). What reinforced the architect’s leadership was mastery of geometry and knowledge of ancient roman architecture, the latter a powerful source of legitimacy for patrons eager to give a persuasive and ‘humanist’ image to their rule. Yet geometry and antiquarianism were sources of professional knowledge often in conflict with each other. While the mastery of geometry gave the architect a scientific and rational way to organize the design and building process, antiquarianism required the adoption of forms taken from ancient sources, which were often difficult to integrate within new building programs. What became increasingly evident from the Renaissance on was the conflict between architecture as science whose goal is the optimization of building practices according to scientific and economic criteria and architecture as a form of representation whose goal is the embodiment of a metaphysical tradition. Within this conflict, geometry itself played an ambivalent role as it was a discipline whose ordering principles had both a cosmological (and religious) meaning, and abstracting power that made geometry consistent within the universal equivalence implied in the logic of commodity exchange. 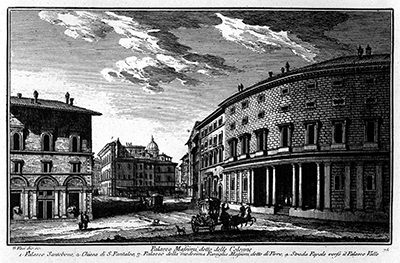 Palazzo Massimo alle Colonne, Rome, in an engraving by Vasi. The conflict between architecture as science and architecture as representation is at the core of the work and career of Baldassarre Peruzzi, one of the most extraordinary architects of the early 16th century and the subject of a excellent study by architectural historian Ann C. Huppert: Becoming an Architect in Renaissance Italy: Art, Science and the Career of Baldassarre Peruzzi. Virtually unknown to general public, Peruzzi is a cult figure among scholars focusing in Renaissance architecture. His building and drawing skills are legendary and some of his designs such as the Villa Chigi known today as ‘Farnesina’ (1506-12) and Palazzo Massimo alle Colonne (1532-36) both in Rome can be considered among the most sophisticated outcomes of early 16th century architecture. Born in Siena, Peruzzi got his formation as artist in close proximity to Francesco di Giorgio, an architect and painter known especially for his military architecture, and whose mastery of engineering made him an essential figure in the consolidation of architecture as applied science closely related to geometry and mathematics. Although di Giorgio left his most important mark in the city of Urbino, his collaborative and scientific practice was influenced by the artistic ethos of a city like Siena in which commerce, the rational organization of vital resources such as water and warfare prompted artists to become experts in mathematics and engineering. It was with such advanced background that Peruzzi moved in Rome at the beginning of the 16th century and found himself in a place where one could find within very few square miles Bramante, Raphael, Michelangelo and Antonio da Sangallo the Younger working (and sometimes ferociously competing) side by side. To have a taste of the ferocious competition within the artstic milieux of early 16th century Rome one can read the epistolar exchange between Michelangelo and Sebastiano Del Piombo exhibited in the recent show ‘Michelangelo and Sebastiano’ at the National Gallery in London. See: Matthias Wivel (ed. ), Michelangelo and Sebastiano (London: National Gallery, 2017). Yet in spite of his unquestionable skills, high reputation among peers, and great influence on subsequent generation of architects (among them Peruzzi’s pupil Sebastiano Serlio, author of the most influential treatise of architecture in the 16th century) Peruzzi did not achieve the fame of his contemporaries. Among the many causes of this lack of recognition may have played a role the rather ambiguous Peruzzi’s biography penned by Giorgio Vasari for his Lives of the Most Excellent Painters, Sculptors and Architects, a book that apart from becoming the foundation of modern art history writing contributed to canonize the artists as a competitive and entrepreneurial individuals focused on the development of a recognizable ‘maniera’ (style). As noted by Huppert, what Vasari found disappointing about the talented Peruzzi was the latter’s timidity and modesty, indeed his lack of entrepreneurialism and self-promotion. Roman Amphiteatre of Verona, drawing by Peruzzi. According to Vasari this prevented Peruzzi to get the proper recognition and rewards from his patrons. Contrary to Vasari’s account Peruzzi did professionally well, and was never short of work and commissions. Yet the fact that Peruzzi never earned the astronomical wages of artists such as Raphael, Michelangelo and Vasari himself did bother Vasari who valued so much courtly success. For Vasari success, or what today we can call ‘stardom’, was not just an ego issue but the only way for the then newly born ‘free-lancing’ artist devoid of guild protection to survive the precarious working conditions of the liberal arts competitive ethos. What makes Huppert’s study interesting is that the Renaissance architect of which Peruzzi is a paradigmatic case is studied not just in terms of the work produced but also in terms the professional conditions through which the architect first emerged as a specialized professional figure and how these conditions deeply affected the cultural reception of the architect’s work. Another interesting aspect of Huppert’s study is its focus on one specific aspect of Peruzzi’s work: his drawings. Peruzzi can be considered the architects’ architect because his influence was not so much coming from his rather few realized buildings, but from his rather impressive body of drawings which counts something like 500 sheets and which were carefully studied (and sometimes copied) by other architects as precious graphic information. Unlike many of his contemporaries, Peruzzi often drew using orthogonal projections thus following Vitruvius’s and Alberti’s recommendations who considered plan, section and elevation the most objective representation of architecture. This means that Peruzzi’s relationship to ancient monuments was not so much moved by the ‘image’ of these monuments but by their scientific knowledge as artifacts, which Peruzzi often rendered with mathematical objectivity. 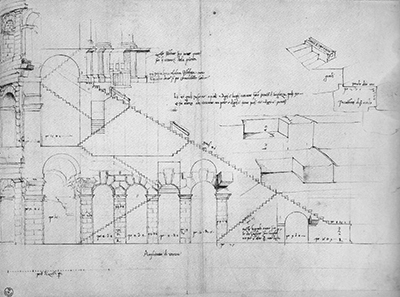 While in his famous letter to Pope Leo X Raphael advocated the survey and the re-drawing of ancient roman structures as a way to preserve their memory, Peruzzi’s relationship to antiquity was motivated by his desire to reduce ancient ruins to a database of forms ready to be use in new constructions. Forum Holitorium of Rome, drawing by Peruzzi. As emphasized by Huppert, Peruzzi’s drawings never indulge in anything that is extraneous to architecture itself and they are driven by a strict economy of graphic means. For example Peruzzi represented monuments by paring down the drawings to their crucial features rather than duplicating repetitive elements. This technique, which anticipates the more scientific architectural rendering of the 18th and 19t century, gives to Peruzzi’s graphic style a beauty of precision which has been rarely matched by other architects. Although often executed by free hand, Peruzzi’s sketches of ancient ruins are always accurately measured and this is what made them extremely useful to him and other architects. For Peruzzi drawing was an investigating means, a way to study architecture, and it is moving to see how an architect so much pressed by jobs never lost his curiosity about architecture as a form of research. If today architects run their practice more as managers, or at best as critics of work done by their employees, in Peruzzi’s time architects considered as an essential component of their practice not just the design of buildings, but also the study of architecture itself. In the 15th and 16th century the knowledge of both ancient architecture and architecture in general was heavily mediated by the authority of architectural treatise such as Vitrivius’s De Architectura Libri Decem. Yet architects were busy to find consistency between the ancient author’s precepts and the extreme variety of ancient roman architecture. By extensively studying ruins, both Bramante and later Peruzzi bypassed the authority of Vitruvius and instead approached ancient architecture in a radically empirical way. They both drew and measure ruins and used them not as objects of nostalgic contemplation by as design material. Most Renaissance architects, including Peruzzi, came from the figural arts, especially from painting. In her study Huppert insist on the importance of Peruzzi’s learning in the field of the figural arts for his work as architect. Crypta Balbi, drawing by Peruzzi. As it is well know the most important ‘revolution’ that took place in 15th century painting was the development of mathematically constructed perspective. Yet the art of perspective cast a long shadow further back beyond the Renaissance to a more profound tradition of research that from antiquity reached the middle-age and that it is known among historians as the science of optics. At stake in optics was a problem that had both scientific and theological implications and that could be roughly summarized in the question of how we can trust the appearance of phenomena, how human sight, which is notoriously fleeting and deceptive, could be the basis of a truthful knowledge of the world. It was by properly answering to this question that perspective developed not as a means of representation, but as topographical survey technique, as a way to measure cities and their territories. Painting would become a crucial site to test the efficacy of perspective as a way to create the ‘illusion’ of depth onto the two dimensional surface of the painted image, but it was the task of measuring real topographical situations and the necessity of translating these measures into scientific notations such as plan and elevation that would make perspective a fundamental design instrument. Florence and Siena were cities in which survey was a crucial tool to give spatial order to urban space and it was here that perspective became the nexus of science, aesthetic, but also technology and economy. In cities where manufacture, commerce and financial trade were the leading economic forces applied mathematics was an essential knowledge for any professional including artists. As described by Huppert this milieu empowered Peruzzi with a background that would make him at ease working across diverse fields such as painting, architecture, engineering and mathematics. Yet this background is also what made Peruzzi’s practice highly collaborative and spread across different works and projects where Peruzzi worked more as a collaborator or consultant, rather than as autonomous author focused on a recognizable oeuvre. This, as Huppert suggests, may be the reason why, with his strong investment in research and extraordinary graphic abilities, Peruzzi did not deliver an architectural treatise and instead left us with an overwhelming body of monuments surveys, graphic notations of details, and archeological reconstructions of ancient complexes. 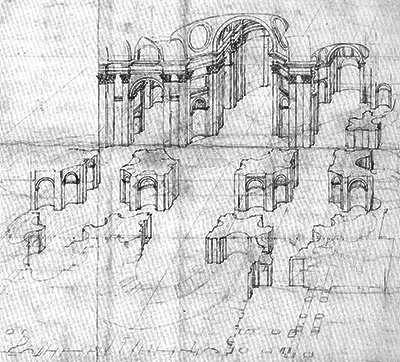 Of course, as Huppert noted, it may be that Peruzzi produced many of these drawings in preparation of a book, but it is easy to believe that his radical empirical and investigative approach prevented him to arrive to a stable taxonomy of ancient Roman architecture and forced him to recognize infinite variety as the only way to understand this architecture. Such empirical approach to ancient architecture was revolutionary since it implied something that would become openly discussed only in the 18th century with the rise of scientific thought as a leading cultural force within the arts: the irreducibility of architecture – especially ancient architecture – to any stable canon. One has to realize the potential ‘heresy’ that such a position could have evoked in the 16th century just few years after Peruzzi’s death when, within the strict ethos of catholic counter-reformation, deviations from the Vitruvian canon implied deviation from the religious canon of which orthodox Vitruvian architecture was meant to be the most tangible embodiment. Peruzzi’s radical empiricism is fully reflected in his design: his architecture is both philologically accurate vis-à-vis ancient precedents, but also surprising and unprecedented in terms of formal inventions. This approach can be appreciated in works such Palazzo Massimo alle Colonne in Rome to which Huppert unfortunately reserve a very succinct paragraph. On this extremely important building, perhaps the most accomplished architecture of Renaissance Rome see Valeria Cafà, Palazzo Massimo alle Colonne di Baldassarre Peruzzi. Storia di una famiglia romana e del suo palazzo nel Rione Parione (Padova: Marsilio, 2008). In this building Peruzzi masterfully adapted the typology of the Palazzo to the curved profile of the Via Papalis, one of the most important street in Papal Rome and to the foundations of the Domitian stadium de facto designing the first convex façade in the modern era. In this way Peruzzi was consistent to the ancient monument and at the same time developed a new idea of monumental façade whose point of view would be not just the frontal one, but the one of the dynamic street passer-by. Cut-away bird’s eye view of St. Peter’s basilica drawn by Peruzzi. As Huppert emphasizes the attempt to capture the dynamic of human perception in movement is at work also in the few but extraordinary frescos executed by Peruzzi in Rome. The ones that deserve mention are the famous ‘painted loggias’ that Peruzzi executed in the Farnesina. Here the trompe l’oeil effect of the painted loggias was developed from a lateral point of view, thus addressing the approaching visitor from the side enfilade. Yet where Peruzzi fully displayed his versatility and mastery as architect was on paper. He drew not just precise drawings from ancient monuments, but also beautiful renderings of his own designs. Among these, the two most spectacular are the perspectival section of his proposed extension of the 14th century San Petronio basilica in Bologna and the cut-away, bird’s eye view of his proposal for the reconstruction of St. Peter in Rome. Both drawings can be considered the starting point of one of the most consolidated traditions in the history of architectural representation: the art of ‘rendering’. Differently from both the technical drawing – in which the goal is to control the measures and the constructive logic of an artifact – and the study drawing in which the architect develop the formal idea of the artifact, the ‘rendering’ is instrumental to explain a design to the patrons or to a wider audience. The rendering is thus the ‘public’ presentation of architecture, before architecture gets built, and often the only public existence of architecture when the rendered artifact is not executed as built fabric like in the case of these two designs by Peruzzi. As Huppert noted, these drawings shows Peruzzi’s awareness of the drawing’s effect on the viewer. By combining section and perspective in the case of the San Petronio drawing and section, plan and elevation in the St. Peter drawing, Peruzzi provides all the design information in one image. Detail of an annotated drawing of San Domenico by Peruzzi. The enormous body of drawings left by Peruzzi and which constitute Huppert’s main focus on the work this extraordinary architect, demonstrate how drawing itself (even more than building) becomes the medium that defined the professional identity of the architect as a figure clearly distinguished from the master-builder. It is not by chance that between the 16th to the 20th century there is a strict relationship between the increasing prestigious role of the architect as ‘author’ and the importance of drawing in architecture. The first fully ‘professional’ architects such Di Giorgio, Sangallo the Younger, Peruzzi left an impressive body of graphic material whose legacy has even overshadowed their built output. Yet in spite of its artistic merits, in the hands of these architects drawing was a medium that not only ‘rendered’ the form of architecture, but also correlated architecture itself to its financial control. In this sense one of the most interesting projects by Peruzzi is his design for the reconstruction of San Domenico in Siena after part of the church was destroyed by a fire in 1531. 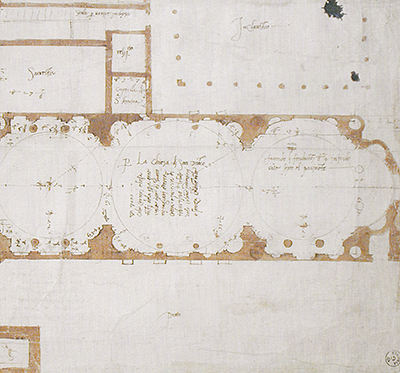 Huppert describes at length the design process for this project, which remained unbuilt and shows how the Sienese architect proposed a plethora of variations all documented by measured drawings and sketches. 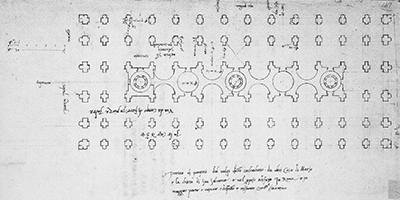 There is one drawing in which Peruzzi drew specific formal solutions for the nave piers by simultaneously calculating their costs. 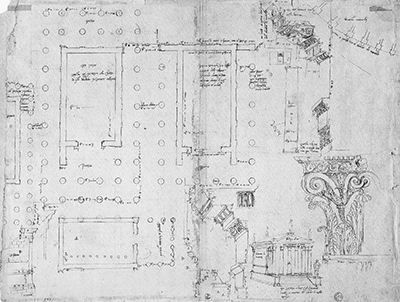 Detail of an annotated plan of San Domenico by Peruzzi. This is an extraordinary document of how from the beginning of its inception ‘design’ is not simply an act of creative invention but also an instrument of economic optimization. Here we see how intimately the concrete abstraction of commodity exchange enters into architectural form and makes formal variation itself an index of economic optimization. Peruzzi’s infinite design process in which every detail is studied in several iterations shows how autonomous formal invention and economic optimization of form were phenomena far from being antithetic to each other as much of modern and contemporary historiography made us to believe. The way in which Peruzzi correlates formal variation to economic feasibility anticipate contemporary forms of building optimization such as BIM and REVIT in which design is immediately connected with the financial apparatus that governs the building industry. It is for this reason that Huppert’s book rather than being just a monograph on a brilliant and elusive Renaissance architect is also (and I would argue especially) an extraordinary archeology of architectural design, its politics and its technologies. I wish that Becoming an Architect in Renaissance Italy will be a reading not limited to historical scholarship, but a provocation to us as architects to rethink the historical circumstances of how we became architects. In a time when architecture is at the peak of its mediatic success but suffer a chronic crisis in terms its professional condition, this book is a vital tool to understand the structural potentials and limits of the discipline itself.